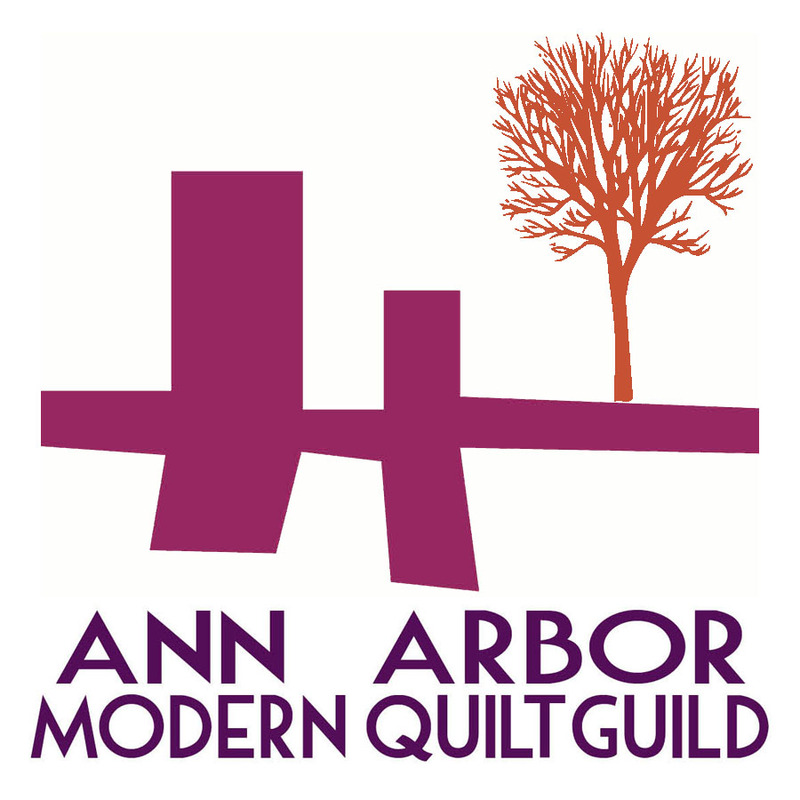 So, this triangle quilt came about because when I was at the Ann Arbor Modern Quilt Guild retreat this summer, finishing up my scrappy trip along, basting my drunkard's daisy quilt, and beginning to piece the Lotta Jansdotter quilt, Emily was piecing this beauty. In case it's becoming a thing, I am going to present my thoughts on it here. The triangles shrink left to right when you sew them together, but only lose 1/4" height top to bottom. And when you join rows (losing 3/4" total). Mine are 7.5" high (which makes the sides 8 2/3" each - based on geometry), and I went with 18/row and 13 rows - which is a little over 6 feet wide, and 7.3 feet tall. How many should you cut? Well, what kind of quilt do you want? How about an equation? triangle height = 48"/8 + 0.75 = 6.75"
in our example: side length = 2 * 6.75" / 1.732 = 7.8"
number of triangle pairs = 36" / (7.8"-.5") .... roughly 5 pairs, so about 10 triangles/ row, or 80 triangles for this 8 row quilt. I decided to use patterns from some of my Spoonflower fabrics for the demos. You want to have your triangle height running along the grain of the fabric, either the crosswise or the lengthwise grain is fine - depending either on convenience or on the pattern of the fabric. But the bottom side should be aligned on the grain, because, well, it is a triangle, and triangle edges are notoriously stretchy except where they run along the grain. step 1: make sure the grain is going in the right direction! The first blocks are easy, just line up the points and sew. 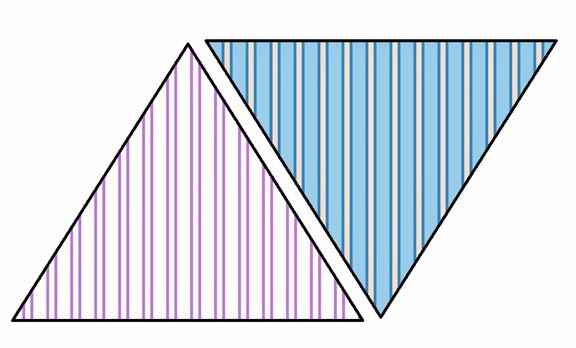 Press the seams, then pick up another triangle. You may be thinking that this is a good time to chain piece- well, don't. Your best chance to line up triangles (unless you have clipped all of them) is to leave a corner free. On that note, I found it helpful not to clip dog ears, too. Line up your new triangle with free corner and the folded under dog ear. Although I did chain piece them in a fashion - I started all the rows at once! I sewed 13 triangles to 13 rows, then pressed them open, then started over. These seams do get very bulky, though. 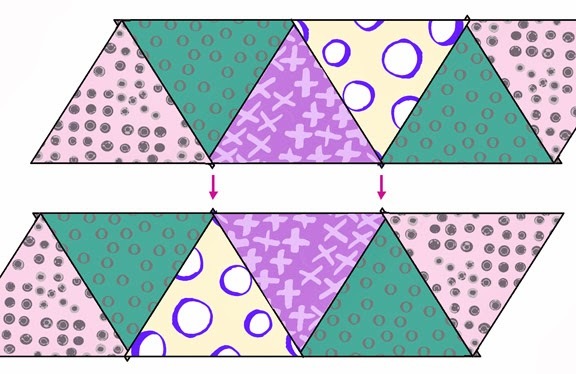 This is a fairly quick and dirty way of powering through triangle piecing. If you want a more elegant approach, I would suggest this tutorial from Adrianne at On the Windy Side.